The tool collection will take place near Thame's Market House (Citizens Advice Bureau) on Saturday 11th May from 9:00 to 13:00. Every year the Thame & District Rotary Club runs a collection point for unwanted tools. In 2019 Thame & District Round Table members will be providing support with this event. At the same time, Thame & District Rotary members will be displaying a ShelterBox tent in front of Thame Town Hall to raise awareness of the work done by SheterBox to help people affected by natural disasters around the world. The collected tools are then taken to 'Tools for Self Reliance' (TFSR) collection centre in Southampton. The latter are a charity which refurbishes them and sends them to NGO's in Africa. The NGO's then distributes them FREE to men and women which helps them to obtain work. One such trainee is Umu Jalloh. 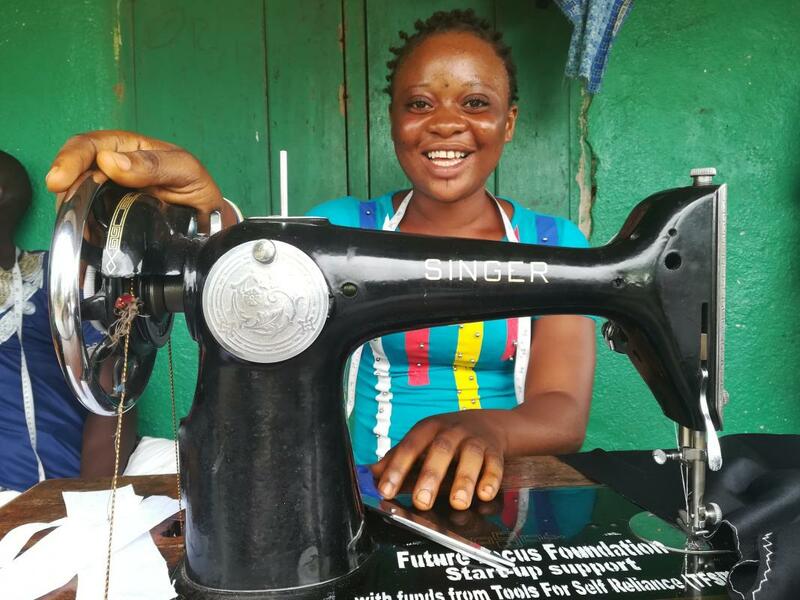 Umu was living in Freetown, Sierra Leone, with her brother when she joined a Tools for Self Reliance course in partnership with Baptist Women’s Union. She had never been to school, and had left the family home aged 14 to escape an arranged marriage – her brother was looking after her, but Umu wanted to be able to earn a living, and contribute to their expenses. She signed up for a course in tailoring, and enjoyed learning so much she often stayed after the end of classes to practice. The business training that was part of the programme meant that Umu felt confident she could purchase the materials she needs for a job, how to cost and price her products, and planning use of income.